Loft bdrm with exposed beams, views of Abbot Hall. Walk to beach, everything! Authentically restored 1800's little home. Cozy, clean and artistically renovated to retain authenticity. Located in Old Town - walk to everything! Small outside patio with BBQ, perfect for morning coffee. Parking for 2 cars. Next to Salem and near Boston. Bus stop 2 blocks. Views of Abbot Hall. This home is unique. It has been described as Enchanting and Sweet. It is. I will meet if you need to, otherwise instructions will be given on how to access the house and best enjoy your stay in this postcard picture piece of the world. It's magic. Charm. Coastal seaside town. Art. Shops. Restaurants. History. Crocker Park. Yes, a bus stop at the end of the street.... but park your car - you can walk to everything in Marblehead! Sorry, children under the age of 7 are not suitable in the house because of stairs and curtains that hang to the floor on every window. Unfortunately the house is not small child friendly. I am a graphic artist who has discovered a love for renovating homes! Now I rent vacation properties. I enjoy beauty in nature, good food, a long walk by the ocean... creativity. I like to repurpose and create things I find - a lot of items in my homes have been crafted by myself and other local area artists. I like meeting people from all over the world. It's nice making connections. I love to travel, and appreciate a beautiful clean room, with a view, in a lovely town. The light. The location. It's beautiful. Clean. Old but modern. Charming. Sweet. Magical. "I just love waking up here"
The town of Marblehead is exquisite. Not many places on earth like this. It's "postcard" New England. Bathroom 1: In the loft area, top floor. Tiled, small shower. Toilet and sink. All newly renovated. Bathroom 2: Toilet and sink located on the ground floor. In the heart of Old Town Marblehead. Walk to everything... beach, starbucks, movie theater, restaurants. A 5 minute walk to Crocker Park and one of the best views of the Harbor and Marblehead Neck. Stunning. Window units. Please shut all the windows if using. Thank you! The earth thanks you. Thermostat located in living room. Eat in Kitchen - Dining room table. Counter has stools for bar style eating. Outside seating area. Lovely for early morning coffee. The tree leaves are a bit of a problem. I will leave a BLOWER in a cabinet on the ground floor. Blow off the patio area when needed. The windows are ancient. Some have weights and balance still, and don't require a stick to keep open. Some need the stick. Please use caution when dealing with the windows. TRASH: Pickup on Tuesdays. Please put trash at end of driveway for pickup. Use the trash bin w/out a lid for recyclables along with the blue container. You can combine: paper, metal and glass. Please recycle! It's good for the earth. DRIVEWAY: Use caution!!! The pole is a huge obstacle!!! Remind yourself when you get ready to back out. Watch the pole!!! I rented it for 3 weeks and did not want to leave. The decription was "authentic, rustic luxurious little home" and it certainly was that and much more! 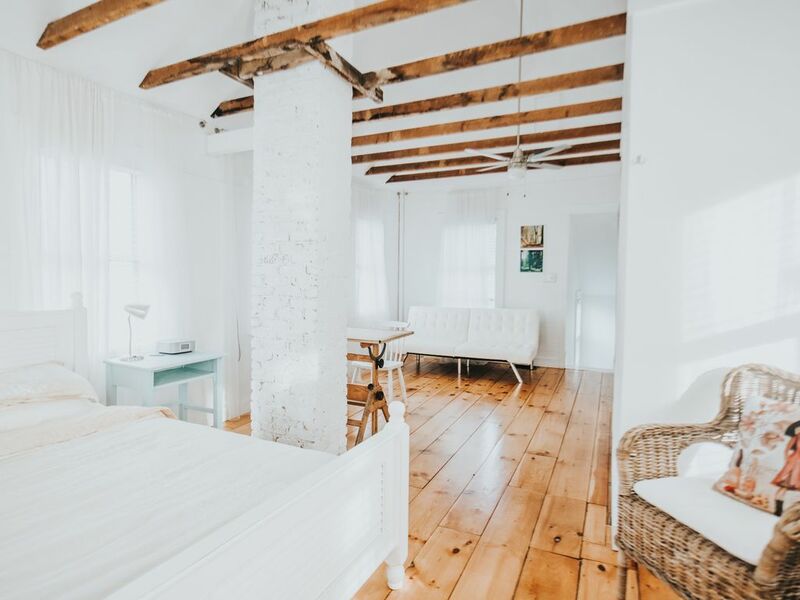 From the crisp white walls to the etheral feeling of the huge loft space, it was the perfect place to relax and feel unencumbered. It was clean, charming and comfortable. You are within walking distance to boutique shopping and great restaurants. Just far enough away from Boston...but not too far. Natasha was the perfect host. Checking in to make sure I had everything I needed. Was always available to answer any questions I had. Everything about this home was perfect! I cannot wait to get back there!!!!! The house is well maintained, up to date and very comfortable. Lots of space, absolutely quite and spotless. Really comfortable. Hope to be able to return again - soon. Charming, clean and conveniently located. The owner, Natasha, is very pleasant as well! We were so pleased with everything. The cottage is indeed quaint and was perfect for the two of us. The bed was incredibly comfortable and I loved the shower. Everything was clean and Natasha very welcoming. We loved being able to leave the car parked and walk to shops, restaurants and the shore. Very friendly town. Had a great time at Maddie's Sail Loft! Our only regret was not sticking out the wait for breakfast at the Driftwood. We would love to return again only stay longer next time. Highly recommend this place. Thanks Natasha! Holidays will be charged at peak rates. No children under the age of 6 as the house is not child friendly (long to floor curtains...) No pets No smoking Enjoy this special place!